Getting at the answers requires a lot of data. 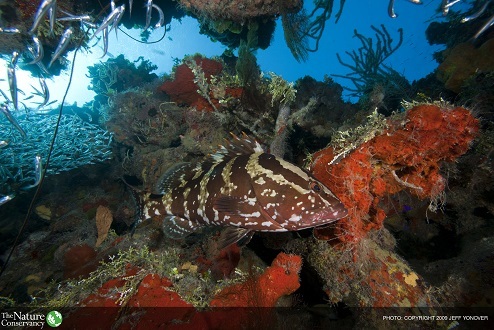 The team used data on ecologically and economically-important fish species, such as parrotfish, snappers, and grouper, that have been collected from 335 in-water surveys across forereefs in the Bahamian archipelago. The team also compiled twenty-four predictor variables, or variables thought to impact fish stocks. These variables described a variety of environmental and socio-economic metrics, including water depth, coral cover, proximity to nursery habitats, population size, and the distance from and size of nearby fish markets. Using these datasets, the team created three models, each with an associated map. 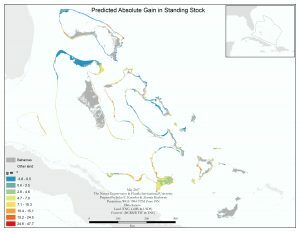 The first model estimated total fishing pressure across the region, and was used as an input to the second model, which estimates current standing stock. This model could then be used to estimate potential standing stock under a variety of management scenarios. For example, by reducing fishing pressure to zero, the model can estimate what fishing stocks will look like if a no-take zone or similar management initiative is implemented. This modeling exercise also revealed interesting insights on the drivers of fish production on Bahamian coral reefs. Biophysical gradients, especially those related to depth, coral cover, temperature, rugosity, connectivity to nursery habitats, and distance to spawning aggregation sites strongly affected the biomass of fisheries species. Human impacts on biomass were best predicted by the size of and distance to nearby fish markets, indicating that data on nearby markets, indicating that data on nearby markets can be used to estimate and map fishing pressure. Model results have now been incorporated into Marxan , which is a suite of software tools used in conservation planning, including marine protected area (MPA) design. The Bahamas is on its way to meeting its goal of increasing the percent of its waters covered by MPAs from ten to twenty percent under the Caribbean Challenge. Fish production data resulting from this work can be used to identify key locations for new marine reserves which will optimize ecosystem services. Data is currently being prepared for sharing via the the Mapping Ocean Wealth Atlas. Informed by science, communications and policy work, Mapping Ocean Wealth visualizes in quantitative terms all that the ocean does for us today, so that we make smarter investments and decisions for the ocean of tomorrow. Opt-in to receive Mapping Ocean Wealth e-News.